This post was originally written in 2014, updated for Lent 2016. This Wednesday, February 17, within the First Week of Lent marks the beginning of the traditional dates of the Lenten Ember Days. 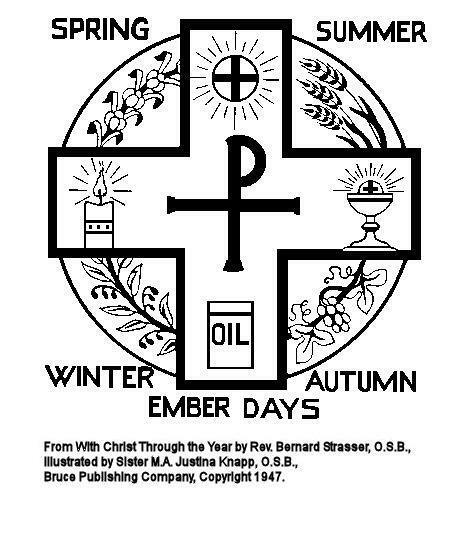 With the reorganization of the Liturgical Year by Vatican II, the Ember Days were retained within the Ordinary Form, but dates and form were left to the episcopal conferences. But this doesn’t restrict obtaining a deeper understanding of this very ancient tradition of the Church, nor does it prevent a personal observance within our domestic churches. This past fall I wrote a lengthy piece on Contemporary Observation of the Ember Days and suggestions on how to personally observe them even in the Ordinary Form of the Liturgy. Today I’m adding a few more thoughts, particularly on these Lenten Ember Days. Four times a year, approximately three months apart, near the beginning of each season of the solar cycle (winter, spring, summer and autumn), the Church set aside three days aside (a total of twelve days in a year) to ask for blessings upon mankind, and to pray in gratitude for the blessings of nature, particularly those used by the Church in her Liturgy, such as olives, grapes, and wheat. This is also a time set apart to thank God for the sacraments and pray for priests, particularly those who were being ordained. These days are marked with prayer, fasting and abstinence and stress spiritual renewal; Ember Days could be regarded as quarterly spiritual check-ups. On...Ember Days the Church is accustomed to entreat the Lord for the various needs of humanity, especially for the fruits of the earth and for human labor, and to give thanks to him publicly. (45). While in theory these are supposed to occur quarterly, mimicking the changing seasons of the solar year, the traditional dates for the Ember Days do not divide the year equally in fourths. The original days were fixed upon the first week of Lent, which date changes every year. It has only been 69 days since the Winter Ember Days, and it will be 92 days until the Summer or Pentecost Ember Days. Spring seems to be a misnomer, as the Vernal Equinox is almost four weeks away. But the word Lent comes from the Anglo-Saxon word lencten, which means Spring. Although the Northern Hemisphere might currently be experiencing wintry conditions, there are unmistakable signs that spring is near. One question that comes up repeatedly is why are the Ember Days only Wednesday, Friday and Saturday? Is there any rhyme or reason to these days? In the days of the early church, Mass was originally only on Sundays. Gradually other days were added, the development can be seen in connection with the Roman Station Churches, as I wrote about last year in Roman Pilgrimage: Station Churches. The Ember Days fall on the days that had assigned stational churches, originally Wednesday, Friday, Saturday and Sunday. Station churches for Thursdays were a much later addition and are not included in the Ember Days. The Lent Ember Days fall on the Wednesday, Friday and Saturday during the first week of Lent. There are four major intentions of the Quarterly Ember Days, but each set of days has a different flavor according to the corresponding liturgical season. The Lent Ember Days were the last ones added to the liturgical calendar, and they have a slightly different character than the other three. Since the Lenten season already had fasting and abstinence, observing Ember Days in Lent only added a little extra in penance to the already formerly strict laws of Lent. Days of Spiritual Renewal. Holy Mother Church provides us so many opportunities to redirect, refresh and renew. The Lenten Ember Days blends with the season of Lent, providing reminders to continue and persevere in the spirit of conversion and penance. Praying for Priests. The Church no longer regularly ordains priests during the Quarterly Ember Days, but this is a special time, particularly Ember Saturday, to pray for priests and for seminarians, particularly the ones who are about to be ordained within the year. Reflecting the Spirit of the Season. Each set of Ember Days reflect the season of the Liturgical Year in which they occur. The Lenten season focuses on our conversion of our hearts, and also a focus on the supernatural life we receive at baptism, whether it be as a catechumen or a renewal of baptismal promises. The current missal has no particular liturgy for Ember Days, but the use of votive Masses for various needs and occasions. The 1962 liturgy has Ember Wednesday’s Gospel with Jesus foretelling His Resurrection, in the symbolism of Jonah in the whale. Ember Friday presents the curing of the paralyzed man at the Pool of Bethsaida, and Ember Saturday features the Transfiguration of our Lord, all Gospels that remind us of the upcoming resurrection of our Lord. The Lenten Ember Days can provide some additional focus and redirection in these early days of Lent for our prayers of thanksgiving and petition. Even just learning about the ancient traditions of the Church can help deepen our faith and love of our holy Mother Church. This sounds like a very helpful tradition that is worth making use of! I have already lost a little of the enthusiasm with which I stated Lent last week, the Church has so many ways to help us stay focussed on ur goal. Thanks for the article Jennifer!